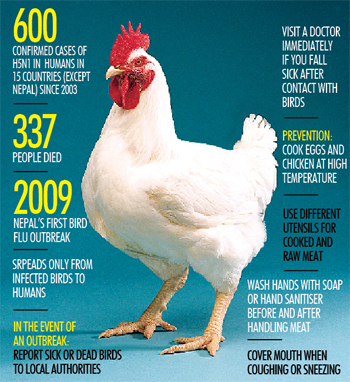 As Nepalis are forced to pry themselves off chicken momo and chicken chili once again, the question on everybody’s mind: what exactly is the difference between regular flu and bird flu? Well for starters seasonal flu comes around mostly in winter and can potentially be prevented through vaccines. Avian influenza, on the other hand, is more lethal. This type of flu is so notorious that it is often compared to the Spanish flu of 1918-19, another avian strain, which spread across the globe in a mere three months and wiped off almost 50 million. In May 1997 a child from Hong Kong died of H5N1, a common strain of bird flu, becoming the first known human victim. After 18 cases and six deaths in Hong Kong, the virus appeared to be under control and possibly eradicated by the end of 1997. However, it reared its ugly head again in 2003 and has continued to evolve and spread. More worryingly, a new strain of virus called H7N9 was detected in China earlier this year, but quick action from the Chinese government meant that the number of cases after April dropped drastically. The Achilles’ heel of the virus lies in its inability to be transmitted from human to human. Humans are infected only when they come in contact with diseased birds making poultry farmers, butchers, and cooks who deal directly with livestock and raw meat most vulnerable. 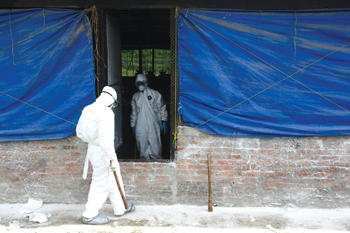 Among the more than 600 confirmed cases reported worldwide through July 2013, nearly all were acquired by direct contact with poultry, with person to person spread being almost non-existent. Aside from agricultural intervention (ie culling the birds), the other means of control is vaccines and antiviral agents. If oseltamivir (an anti-viral agent) is started within the first 48 hours of symptoms, the benefit is significant. But cost and availability of the drug are impediments. While countries in the west have hoarded vaccines in case of an epidemic, they are not available here in adequate doses. So what should those of us in Nepal do? Proper cooking kills the virus so we should only eat meat that is fully cooked and served hot. If eggs are consumed, they should be hard cooked and certainly not runny. Eating or drinking dishes that include blood (‘ragati’) from any animal is highly discouraged. Since 95 per cent of viruses like bird flu enter our bodies from contact between our fingers and the mucous membranes of our eyes and nose, maintaining good hygiene and cleanliness is imperative. Washing hands often with soap or an alcohol-based hand sanitiser is a good idea as is covering our mouths and nose with a tissue or sleeve (not our hands) when coughing or sneezing.